The Country’s Largest Roving Sale Event is back now on its 4th year at Davao Convention and Trade Center! 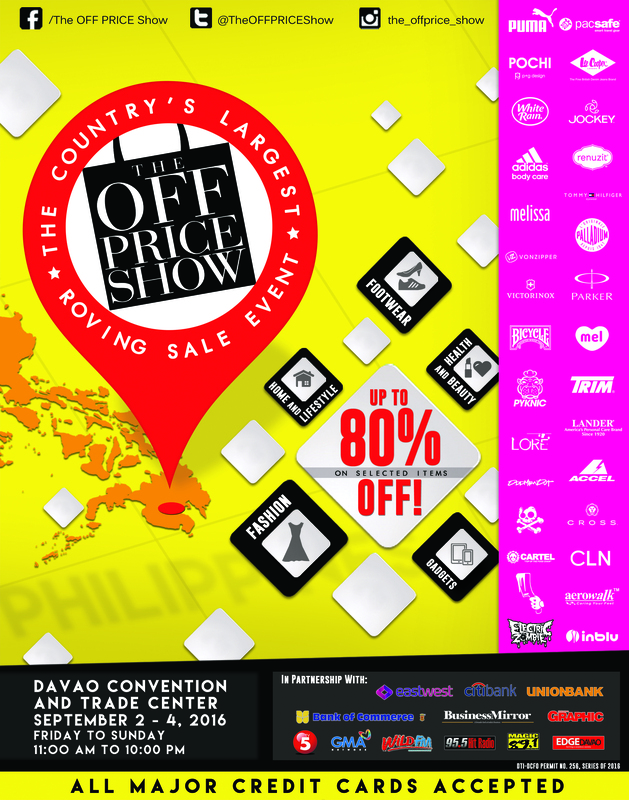 The Off Price Show is the first roving sale concept in the country that features top lifestyle brands from around the globe. These top brands include White Rain, Pochi, Vonzipper, Pacsafe, Adidas Bodycare, H&M, Melissa, PUMA, Palladium, Victorinox, Jockey, Lee Cooper,Tommy Hilfiger Eyewear, Accel, MEL Shoes and a whole lot more. In this event holding the world’s most premium lifestyle names, there will also be a Banchetto comprised of Davao City’s best and well-known restaurants and fast eats, to be located in the outdoor area of the convention center. The Off Price Show will be open from 11:00 AM up until 10:00 PM. All major credit cards will be accepted for purchases made during the 3-day expo sale.